After using Eurolux Body Mist for long, I was looking for a deodorant since sometime and few days back I could feel some nice fragrance from someone and finally I realized it was from my friend using Nike Deodorant Spray. Without being fomal, I straight away asked her which variant was it sine she was smeeling quite good. She told me its Nike Magic Passion in a white colored bottle. Since then this was on my shopping list and finally after using it few times, here is the review on this Nike Deodorant Eau De Toilette in Magic Passion. Nike Deodorant is available in so many different variants like Up or Down, Blue Wave, Fission, Urban Musk, On Fire, Casual, Sensual, Cool Wind, Extreme, Basic Scarlet, Basic Blue, Scarlet Kiss, Party Zone, Cool Wind, Green Storm, Out of Control, Wood Blast, Sweet Emotion, Blue Fantasy, Spicy Love, Free Soul etc. The Nike N150 Magic Passion is a deo spray for the liberated, modern-day woman, who can boast of an independent identity and existence in today’s fast-progressing society. With a 24-hour intensive protection against excessive sweat or body odour problems, the Nike N150 Magic Passion is a whiff of enigma wrapped in subtle sweetness and passionate soulfulness. The soft, floral notes captivate your heart and surround you in an aura of elegant femininity and sophistication. The magical fragrance enchants with its mild, angelic accords and fills your day with a blissful sense of harmony and energetic freshness. Price - Rs 275/- for 200ml. 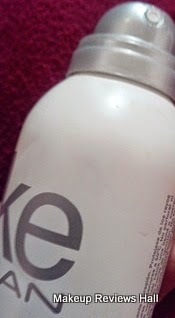 This Nike deo comes in white quite sturdy bottle with a very descent look. The bottle is quite thick and not at all made of cheap quality plastic. It looks firm while holding giving a sturdy feel. The white color with blue lime effects adds to it beauty even more. I really like the overall look of this Magic Passion deodorant. Coming to it spray, which is quite ok to use, a little tight but not too much a problem releases gentle amount of vapors on a single press. However if you press a little more, you could feel all the vapors to be too strong and could interfere in smooth breathing for few seconds, since I felt this to be quite strong fragrance specially for the initial few minute after spraying. I could feel the fragrance to be a mix of deodorant and body perfumes and could not relate to any specific thing. Once you apply it all over, it definitely gives a refreshing aroma after sometime to anyone who comes near you. The only downside is that the fragrance is not much long lasting. I could feel its effect for about 2 hours max in summers and a little more in winters, so in any case I had to reapply it after few hours. Well this is definitely not a problem for me, since I always carry my deodorants and splashes in my purse, specially my Warm Vanilla Sugar Body Spray is always with me most of the time. So this was all about this Nike Woman Magic Passion Deo. I noticed it on someone else, and just bought it after liking its fragrance. I like it on using on myself in summers and winters both but had to reapply it again after few hours. So even if you don't bother carrying a bottle of deodorant with you, then you should definitely try this. Comes in thick sturdy white bottle. Descent spray with descent release. Nike deodorant comes in many variants to choose from. Nice feminine fragrance, definitely noticeable. Easily available online and offline both. A little expensive considering its not long lasting. Appears strong for first few minutes if released more.